Environmental Protection Agency Administrator Scott Pruitt announcing his decision in April to scrap Obama administration fuel economy standards. He's cited this in his efforts to delay, repeal or roll back the Clean Power Plan, the Waters of the U.S. Rule, and a string of other measures. 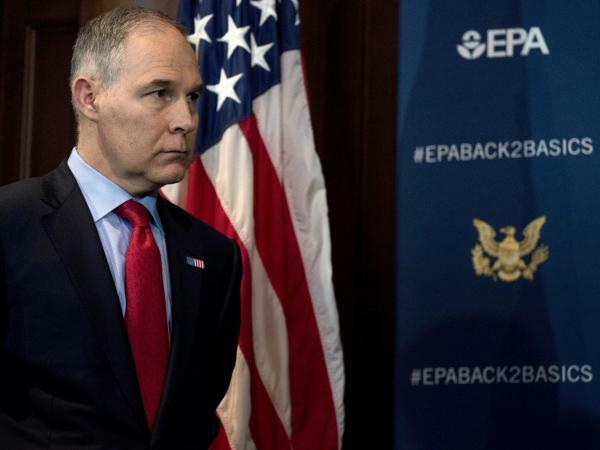 But some argue that many of his actions as EPA administrator are having the opposite effect, and that they could be setting a troublesome precedent going forward. With so many regulations now in limbo, farmers, agriculturalists and others who are regulated by the EPA are "in a state of sort of perpetual uncertainty," says Roger Johnson, president of the National Farmers Union. The most glaring example of an industry where the regulatory environment has become muddier is the auto industry. Pruitt recently announced an effort to review and revise car emissions standards for the nation's automobiles. Those federal standards were set under the Obama Administration with the goal of cutting tailpipe emissions, a major contributor to climate change. They were an agreement, of sorts, between federal regulators, auto manufacturers and the state of California, which has the legal authority to set its own air standards. And California doesn't want the national standards to change. The state has vowed to keep its own stricter standards in place, joining with 16 other states to sue the EPA over the proposed change. The conflict is worrisome to automakers because it raises the possibility of a split in the U.S. auto market. "Having one national standard is immensely important to the auto industry," says Kristin Dziczek, vice president for industry, labor and economics at the Center for Automotive Research. Car makers don't want to have to develop and design one type of automobile for California and another for Texas - especially when they're already competing in a global market. The Trump Administration has been meeting with automakers and wants to negotiate with California to find a middle-ground, but it could take years to resolve. "The difficult part of all of this is the timelines for engineering and designing and producing new engine programs, new transmission programs, new vehicles - that takes years, sometimes a decade," Dziczek says. In other words, automakers need to know what the rules are now, so they can plan accordingly. "I don't think it's a well thought out [plan] that deals with the realities of the industry," says Sandra Rothenberg, a professor at Rochester Institute of Technology. "This is, I think, something to just get a lot of publicity and make it seem like they're cracking down on what Obama did." Pruitt has moved to delay, block or reform roughly two dozen environmental regulations at the EPA, according to records kept by Harvard Law School's Environmental Regulation Rollback Tracker. Many of those efforts have been praised by industry groups. But even some who wanted change are disappointed in what they've seen so far. Johnson, of the National Farmers Union, says he and many others in the agriculture industry wanted to see the Trump Administration repeal and revise Obama's Waters of the U.S. Rule. That rule, which aimed to clearly define which waters the EPA can regulate, took the Obama Administration years to create. The goal was to provide needed clarity under the Clean Water Act, Johnson says, but it came up short. Pruitt has delayed the rule's implementation for two years and begun the process of rewriting, but it could take years to complete. In the meantime, Johnson says, "The spot we're in right now is right back to where we were before that rule was even proposed." Supporters argue that there's inherent uncertainty - at least in the short-term - during any regulatory change, especially when there are lawsuits involved. "It's going to take some time," says Ellen Steen, general counsel for the American Farm Bureau Federation. "But I think it's achievable to have a final rule out in this administration." EPA employees point out that making lasting regulatory change can be an arduous, years-long process. Still, Pruitt has seen early legal setbacks on several actions. "I think a lot of people have been struck by the real thinness of the proposals coming out of the agency," says Lisa Heinzerling, who served at the EPA under Obama. She says Pruitt's proposal to change fuel economy standards was just 38 pages long, while the Obama administration's justification for them was more than a thousand pages. The tenuousness of Pruitt's position doesn't help either. There are at least a dozen investigations into his ethics and spending at EPA. And while supporters of his regulatory agenda are confident that the controversies aren't slowing his efforts, they're certainly not helping. "What he's done is plunged the agency and regulated industry and the public into chaos," says Heinzerling. "[He's] thrown everything up in the air, delayed everything across the court, lost a bunch in court and then gone ahead with his agenda, which leaves, I think, nobody certain about what's to come." Regardless of Pruitt's effectiveness in rewriting or rolling back environmental regulations, there's a broader concern about the precedent he may be setting. The Trump Administration has tried to undo much of what was put in place by the previous administration. In fact, Gina McCarthy, who headed the EPA under Obama, says that seems to be one of Pruitt's top priorities. "I don't want every administration to come in and think that their only job is to undo the one that happened before," she says. "We cannot have constant changes to the signals we send to business and the public in the United States about what we should be doing to protect public health and the environment." McCarthy certainly trumpeted 'regulatory certainty' during her time at EPA, and says administrations normally tweak regulations, build off them or change them. But she says it's highly unusual to try to throw out everything a predecessor put in place. Others worry that wide policy swings may become the new norm, given the divided state of the nation's politics. "Knowing what the rules are, and that they don't change that often, strikes me as something we all should agree to," says Peter Van Doren, who specializes in regulation at the Cato Institute, a libertarian think-tank. "But it appears that both sides want to gin up their bases to scream and fight and give money and holler." Longer-term certainty could be achieved through legislation, Van Doren says, but Congress can't seem to agree on much of anything these days. So he and others say they expect different administrations to come in and set the regulatory agenda. "In this environment where [priorities] can change every four to eight years, that's probably the reality," Dziczek says. "That regulatory certainty lasts as long as the administration lasts." Despite the focus on the investigations into his ethics and spending, Scott Pruitt has had a busy first year at the Environmental Protection Agency. He's moved to delay, block or roll back roughly two dozen environmental rules, always citing the same mission. SCOTT PRUITT: We're going to provide regulatory certainty. It truly is regulatory certainty and regulatory reform. CORNISH: The idea is that industry does best when it's certain what the rules are. But as NPR's Nathan Rott reports, some argue Pruitt's actions are having the opposite effect. NATHAN ROTT, BYLINE: The auto industry is perhaps the most glaring example of a marketplace where things have gotten a whole lot less certain lately. For the last few years, automakers had been planning for and working under a set of fuel economy standards that were set by the Obama administration until last month. PRUITT: We are determining - I am determining that those standards are inappropriate and should be revised. SANDRA ROTHENBERG: Trying to figure out, am I going to have to design to California's standards or to these new federal standards? ROTT: This is Sandra Rothenberg from the Rochester Institute of Technology. And she says this new potential of having two U.S. car markets - one with strict emission standards, another with looser - is not good for automakers. ROTHENBERG: Because they don't want to make multiple vehicles. ROTHENBERG: This could take years to resolve. ROTT: Meanwhile, the auto industry, which needs years, if not a decade, to develop new engine programs, new technology and vehicle designs, is left in a state of regulatory uncertainty. The same is true for other industries trying to follow other rollbacks at the EPA. ROGER JOHNSON: Good example of this is the Waters Rule. ROTT: Roger Johnson is president of the National Farmers Union, and he's talking about the Waters of the U.S. Rule, another Obama-era regulation that sought to clearly define what waters EPA can regulate. Johnson and other agriculture groups did not like Obama's definition, and they wanted to see the Trump administration change it. Pruitt heard them, delaying the rule for two years, proposing to rescind it. But, as with other rollbacks, Johnson says, little has been offered in its place. JOHNSON: The spot we're in right now is right back to where we were before that rule was ever even proposed, which is in this state of sort of perpetual uncertainty. ROTT: Gina McCarthy was head of the EPA under Obama. GINA MCCARTHY: We cannot have constant changes in the signals we send to business and the public in the United States on what we should be doing to protect public health and the environment. ROTT: McCarthy also trumpeted the phrase regulatory certainty during her time at EPA, and she says it's a good thing to strive for. But there's a bigger question here. Do you think regulatory certainty is achievable in this political climate that we're living in where one administration comes in and does one thing and the next administration could come in and just try to upturn everything the last one did? MCCARTHY: Well, I think you need to look at prior administrations and realize that this administration is very unusual. ROTT: The current administration strategy, McCarthy says, seems to be just overturning everything Obama did. That's not normal, she says, and she hopes that it doesn't become so going forward. Peter Van Doren, who focuses on regulation at the Cato Institute, a libertarian think tank, shares in that hope. But he's not as optimistic. PETER VAN DOREN: Knowing what the rules are and that they don't change that often strikes me as something we all should agree to. But it appears that both sides want to gin up their bases to scream and fight and give money and holler. ROTT: Meanwhile, industry, he says, is stuck in the middle. Nathan Rott, NPR News. Transcript provided by NPR, Copyright NPR.